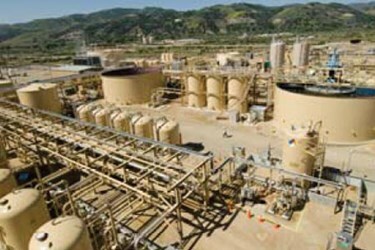 Chevron U.S.A. Inc., a fully-owned subsidiary of Chevron Corporation, is one of the world’s leading energy companies. Chevron subsidiaries conduct business in approximately 180 countries around the world, producing and transporting crude oil and natural gas, and refining, marketing and distributing fuels and other energy products. The San Ardo project involves treatment of produced water for the purposes of discharge to recharge basins and production of Once Through Steam Generator (OTSG) make-up water. The raw produced water temperature is 200°F, and it contains about 25 ppm free oil, 80 ppm TOC, 240 ppm silica, 26 ppm boron, 240 ppm hardness and 6,500 ppm Total Dissolved Solids (TDS). The project goal was to reduce the feed water TDS to less than 510 ppm and boron to less than 0.64 ppm for recharge basins discharge, while achieving 75% water recovery across the treatment system and minimizing the volume of produced water requiring re-injection. For the purpose of OTSG make-up, the project goal was to reduce the feed water hardness to less than 2 ppm as CaCO3.